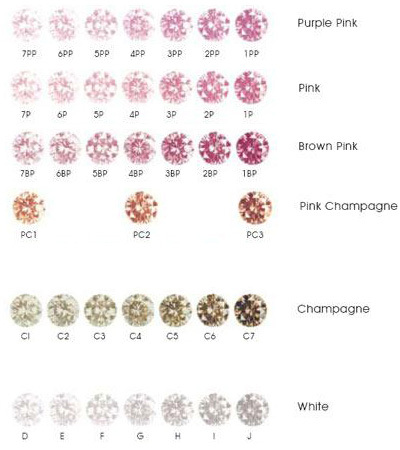 Argyle Champagne diamonds are graded from C1 to C7, depending on intensity of colour. 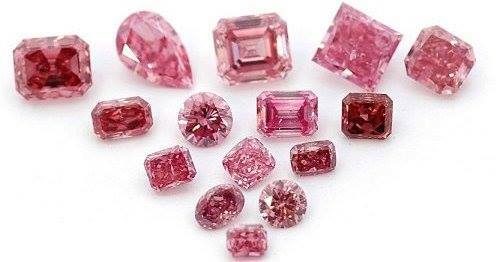 Argyle pink diamonds are graded in four categories. Listed from the most prized Purple pink through to the pink champagne. Purplish pink colours range from 1PP through to 8PP. The most intense being the 1PP. Pink diamonds range from 1P through to 8P. As with the purple pinks, the 1P is the most intense of pinks graded in this category. Brown Pinks are graded from 1BP through to 8BP. With the 8BP diamond having the lowest intensity of colour. Pink champagnes however, are graded opposite to all other pinks. Ranging from PC1 to PC3, the PC3 has the highest colour intensity. The cause of colour in most diamonds is due to trace elements. However, it is thought that the colour of Argyle pink diamonds is caused by their crystal structure. The distorted lattice crystal causes the diamond to absorb light differently and most importantly, reflect different colours. Because of this phenomena, it has been said that Argyle pink diamonds "blush when you look at them". You are dealing with one of Australia's most respected diamond merchants.